Freshman running back Josh Mack is hoisted by his teammates after scoring one of his three touchdowns during Saturday's football game against Bryant at Alfond Stadium in Orono. The Black Bears won 35-31. Josh Mack of the University of Maine tries to outrun the Bryant defense during Saturday's game in Orono. Jaleel Green of the University of Maine looks for running room during Saturday's game against Bryant at Morse Field in Orono. University of Maine quarterback Dan Collins (middle) protects the ball as he runs for a gain during Saturday's game in Orono. 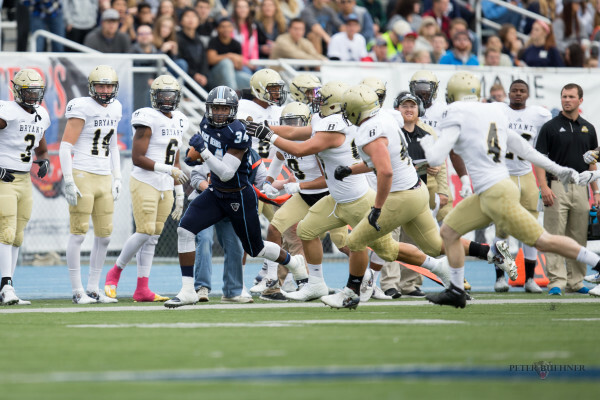 The Black Bears rallied to beat Bryant 35-31. ORONO, Maine — University of Maine first-year football coach Joe Harasymiak’s first win certainly didn’t come easy. And it’s safe to assume he’ll never forget it. 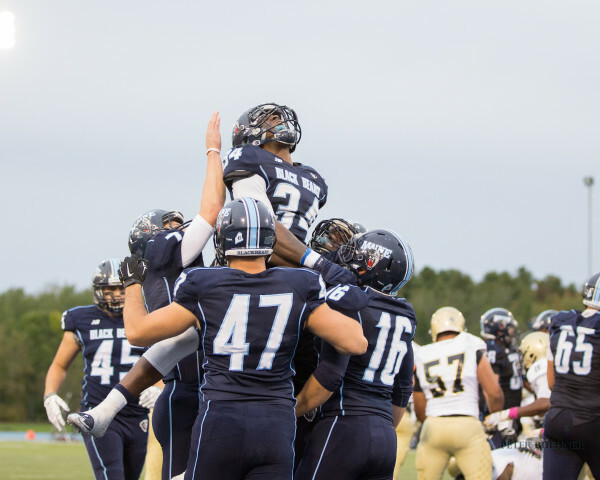 After spotting Bryant University of Rhode Island a 21-0 lead, the Black Bears salvaged a dismal first-half performance by scoring on the final play of the half and then erased a 17-point second-half deficit on Saturday to stun Bryant University with a 35-31 win at Alfond Stadium. 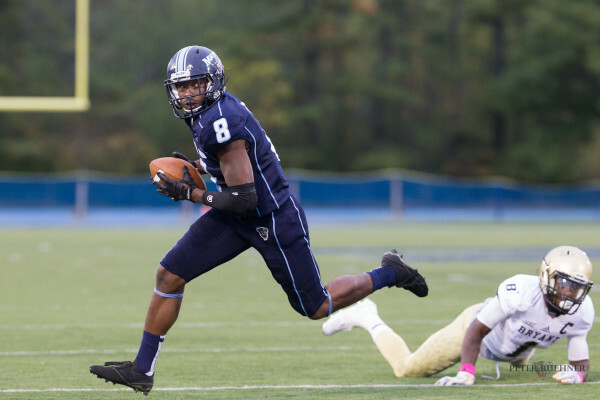 UMaine (1-3) snapped a seven-game losing streak while Bryant fell to 2-3. Freshman running back Josh Mack rushed for 151 yards on 21 carries and scored three touchdowns, with two of them coming down the stretch as Maine scored the game’s final 21 points. He scored on runs of 25 and 9 yards with the 9-yarder putting UMaine ahead with 10:36 left. His runs followed a 38-yard touchdown pass from Dan Collins to Jaleel Reed. Senior quarterback Dan Collins overcame a poor first half (7-for-21, 81 yards, three interceptions, one touchdown) to finish with 14 completions in 31 attempts for 180 yards and two touchdowns. Mack’s 20-yard run with 38 seconds left in the first half started the final series and Harasymiak said that gave him the green light to try to cut into the 21-0 deficit rather than just let the clock run out in the half since they were out of timeouts. Collins threw a 31-yard pass to Micah Wright to put the ball at the three-yard line with two seconds left and Collins flipped a touchdown pass to Wright as time expired. “Dan gave me a chance to make a play. If we hadn’t scored, we would have been in serious trouble,” Wright said. Ricky Perez’s 35-yard field goal to open the second half gave Bryant a 24-7 lead. Mack then capped a seven-play 62-yard drive with a 2-yard touchdown run to cut the lead to 24-14 but Bryant quarterback Dalton Easton’s fourth touchdown pass of the game — his third to Matt Sewall — an 18-yarder, made it 31-14 with 3:57 left in the third period. Bryant wouldn’t threaten again as the Bulldogs generated just 44 more yards of offense. “[Ricard] is some football player. He changed the game, at times, by himself,” Fine said. Fine shouldered the blame for “bad play-calling” especially in the fourth quarter. “We became too predictable. We needed to run the ball more to try to keep our defense off the field,” he said. Bryant was down to its No. 3 running back, Ryan Black, due to injuries to their top two running backs and he sustained a minor knee injury and was ineffective (10 carries, 15 yards). Easton’s fourth touchdown pass was the 56th of his career which ties the school record. He completed 27 of 53 passes for 318 yards and the four touchdowns. He was intercepted by DeAndre Scott with 1:48 remaining as Maine sewed up the win. Following Easton’s final touchdown pass, Maine responded with a six-play, 65-yard drive after Scott’s 44-yard kickoff return. Collins threw a perfect strike to Reed for a 38-yard score. On the ensuing drive, Bryant was forced to punt from its own 30 and Wright returned the punt 53 yards to the B-25 before Mack rattled off a nifty 25-yard touchdown run to cut the lead to 31-28. Maine’s game-winning drive followed a shanked nine-yard punt by Bryant’s Drew Chretien that gave Maine great field position at the B-49. A 12-yard pass from Collins to Reed on third-and-eight extended the drive and a 16-yard pass from Collins to Jared Osumah set up Mack’s game-winning nine-yard touchdown run. Bryant built a 21-0 lead in the first half as Easton threw touchdown passes of 28 yards to Keenan Thompson, on a third-and-25 play, and 25 and 18-yarders to Sewall. The 18-yarder to Sewall came with just 42 seconds left in the half and followed Danny Hughes’ dazzling 49-yard interception return. But Maine answered on the Collins-to-Wright connection to gain momentum entering the second half. Wright (5 catches-53 yards) and Reed (4-for-81) were Maine’s top pass catchers and Ricard, strong safety Jason Matovu and linebacker Christophe Mulumba Tshimanga led the defense with eight tackles each. Sewall (7-for-89), Taylor Barthelette (5-for-83) and Black (5-for-38) were the Bulldogs’ top receivers and linebacker Jesse Nemerowicz (13 tackles) and free safety Charles Keenan (10) paced Bryant’s defense. 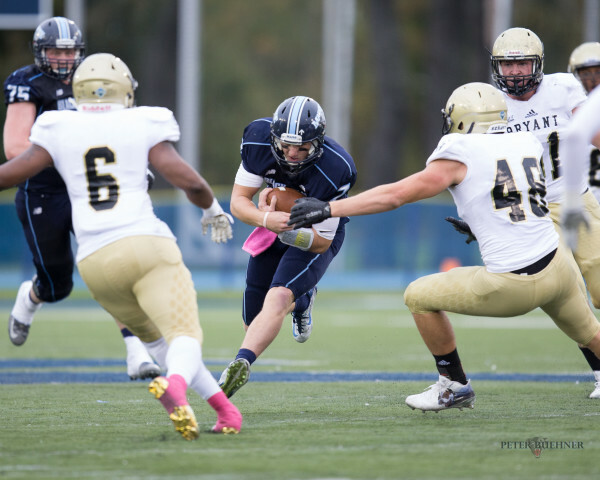 Maine returns to Colonial Athletic Association play at Delaware at 3:30 p.m. Saturday, Oct. 8.